Back to our birthday posts. We missed Jan. 21 (Rusty Greer, Mike Krukow, Lew Fonseca and Johnny Oates) and Jan. 22 (Chone Figgins, who just signed a minor league deal with the Dodgers). It seems we've run into a bad stretch of calendar dates. The only All-Stars born on Jan. 22 were Figgins, Carlos Riuz and Ubaldo Jimenez, each with just one appearance. Only former reliever Dave Smith (two appearances) and Krukow were Jan. 21 All-Stars. We get four All-Stars for today, Jan. 23: Chico Carrasquel (four), Frank Sullivan (two), Mark Wohlers (one) and Randy Gumpert (one). Maybe Jeff Samardzija will make it one day. If you're my age, you probably remember Bevacqua for three things. 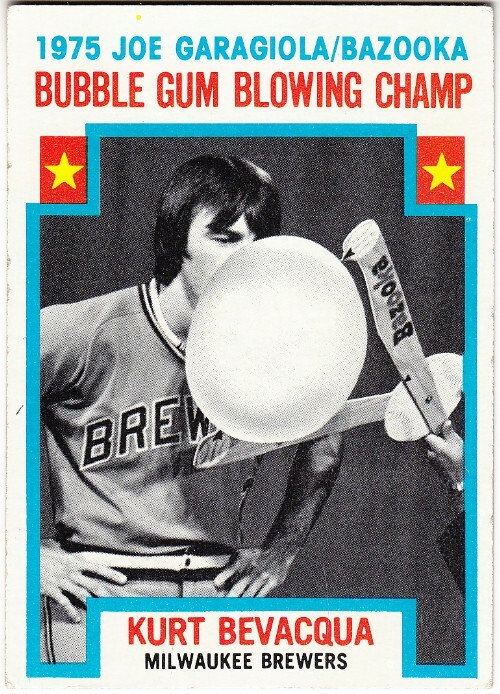 He won the 1975 bubble-gum blowing contest, which got him this card in the 1976 Topps set. He called Tommy Lasorda a "fat little Italian," which led to this infamous Lasorda rant (NSFW). After hitting .200 with one home run for the Padres in 1984, he hit .412 with two home runs and four RBIs in the World Series, although the Padres lost to the Tigers in five games. Bevacqua had another curious baseball card. The Mariners had purchased his contract from the Brewers heading into their inaugural season in 1997. But Bevacqua lost out on the starting shortstop job to Craig Reynolds and the Mariners released him at the end of spring training. 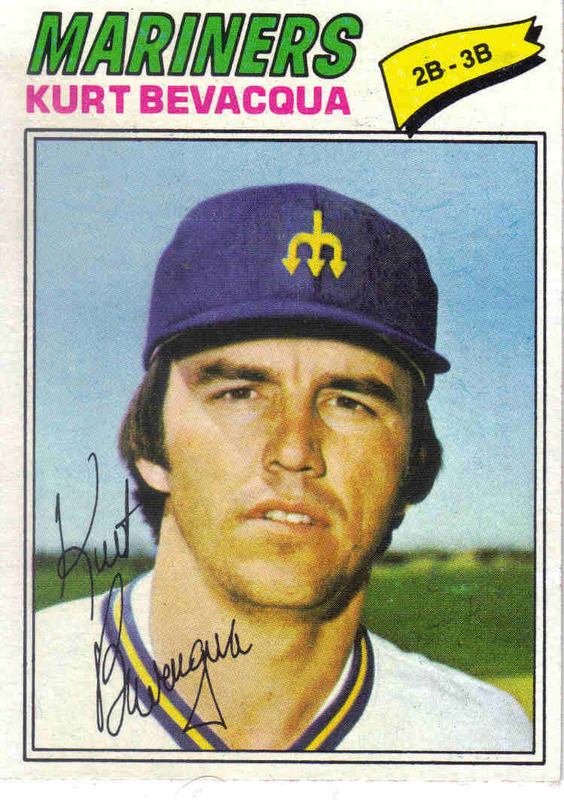 His 1977 Topps card, however, shows him in an airbrushed Mariners cap. Bevacqua carved out a 15-year career as a utility infielder and pinch-hitter, only four times getting as many as 200 plate appearances. He was usually the 24th or 25th man on a roster; today, that spot belongs to a reliever so he'd have trouble hanging around as long as he did. One of the hardest-throwing relievers of the '90s (or any era), Wohlers got the final out of the 1995 World Series for the Braves, but his career is still prone to some what-ifs. What if he had developed a little more quickly into the Braves' closer? What if he hadn't thrown that hanger to Jim Leyritz? What if he hadn't developed Steve Blass disease? Wohlers first reached the majors in August of 1991, just 21 years old. He appeared in six postseason games and looked like the future closer with his 100-mph fastball. But he spent part of the next two seasons in the minors, still trying to master his control, although he was on Atlanta's postseason roster both years. The Braves lost in the 1992 World Series to the Blue Jays, with one of the critical blows being a pinch-hit home run Ed Sprague hit off veteran closer Jeff Reardon to win Game 2. Reardon had come over late in the season to replace the injured Alejandro Pena. Bobby Cox didn't yet trust his younger relievers. In Game 3, Steve Avery allowed a leadoff single in the ninth inning of a tie game. Wohlers came on to face Joe Carter, but after Roberto Alomar stole second, was ordered to intentionally walk Carter. Candy Maldonado eventually hit the game-winning single off Reardon. In 1993, Mike Stanton and Greg McMichael shared closer duties. The Phillies won the NLCS in six games -- the Braves losing twice in 10 innings, with Wohlers getting the loss in Game 5 when Lenny Dykstra homered in the top of the 10th. In 1995, the Braves won the one championship during their run of 14 division titles in a row (depending on how you count 1994 when the Expos had hte better record when the strike hit). The most memorable moment of Wohlers' career came in the 1996 World Series. The Braves had won the first two games against the Yankees and were up 2 games to 1 when Wohlers entered in the eighth inning of Game 4 with a 6-3 lead. Remember when closers would go more than one inning? Charlie Hayes reached on an infield single, Darryl Strawberry singled and after an out Jim Leyritz launched a three-run homer to left on a 2-2 hanging slider. The Yankees went on to win that game in the 10th inning (Avery got the loss) and then won the next two to take the series. Same say Wohlers was never the same after that, like Mitch Williams after Carter's home run in 1993. That's not really true. Wohlers was pretty effective in 1997 with a 3.50 ERA and 33 saves, although his walk rate did spike up. It wasn't until 1998 that Wohlers suddenly lost the ability to throw strikes, walking 33 batters in 20 innings. Demoted to Triple-A, he walked 37 batters in just 13 innings. In retrospect, it seems pretty clear that Wohlers was probably injured. Through May 2 he had a 1.93 ERA and 15 strikeouts and nine walks in 9.1 innings. He then three spent three weeks on the DL, returning on May 25. That's when he suddenly started walking everybody, including five in a one-inning appearance in July. The Braves lost in the NLCS that year to the Padres -- a 10-inning loss in Game 1 set the tone. Wohlers was traded to the Reds in April of 1999. He was first placed on the DL with anxiety disorder but eventually underwent Tommy John surgery. He eventually returned to the majors and had a couple decent years in 2001 and 2002 but re-injured his elbow and called it career.